RED FANG, who recently released their fourth album, Only Ghosts, via Relapse Records, kick off their first U.S. tour in support of the album tomorrow at Slim’s in San Francisco. The Portland–based rock band worked with producer Ross Robinson and mixer Joe Barresi on the 10-song album. “We wanted to leave Portland so we could be a little more immersed in the process, instead of having to think about going to get groceries and stuff,” explained Aaron Beam of working at Ross Robinson’s Venice, Calif. studio. 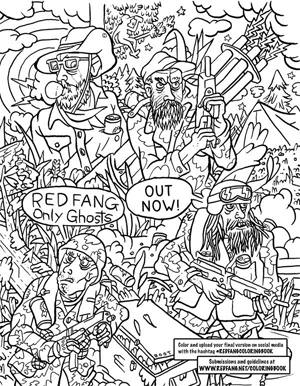 With the launch of the tour, RED FANG have also launch a coloring book contest featuring art created by Tim Root (IG: @fishmittin). The coloring book page, which will be featured in the upcoming issue of New Noise Magazine, is available for download HERE. Entries will be accepted through Dec. 15 with prize packages including a variety of RED FANG merch and a subscription to the magazine. In the week’s leading up to Only Ghosts’ release, the Portland-based rock band have also created a tremendously clever video about wronged comic book collectors seeking Predator-style vengeance (“Shadows” ), partnered with Stumptown Coffee Roasters for a tour only blend dubbed “The Deep” after the song of the same name and lent their music to Pabst Blue Ribbon’s retro pinball machine, The Can Crusher. San Diego fans can take part in a RED FANG Pinball Party on Nov. 22 at Brick By Brick, where they can meet the band, play the Can Crusher and enjoy PBR specials before the show (free tickets available HERE). RED FANG talk coloring in a short clip below.